On November 29th it was announced that kent will do a spring tour during 2008 covering 30 shows in 29 Scandinavian cities, opening in Ås, Norway January 23 and closing two months later in Malmö March 23. 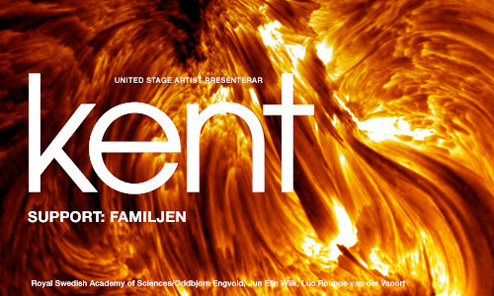 On the tour kent will use the Swedish electro act Familjen as supporting act. Familjen is a one man band consisting of Johan T Karlsson. Familjen is currently visiting his sister i Stockholm by force, and has turned her living room into a studio. Johan is brought up in Häsleholm in Sweden just like another great electronica persona; Andreas Tilliander. Andreas is a part of the Familjen live act where he plays sampler and other instruments using numerical combinations. The Familjen debut album "Det snurrar i min skalle" was released this spring and contains the singles "Hög luft" and "Det snurrar i min skalle". In January 2008 the fourth single "Huvudet i sanden" will be released. Tickets for the Swedish concerts are sold via Ticnet Tel: +46 77 170 70 70, www.ticnet.se and all Swedish ATG and Ticnet sales representatives. Unfortunately due to Swedish laws concerning sound levels there is a 13 year age limit at kent's concerts in Sweden. You have to be 18 to go to the norwegian shows.